Scottish Stained Glass was founded by Martin Faith, a Scottish transplant to the United States. Like any true Scotsman, Martin loves golf and has built stained glass golf crests & panels for golf enthusiasts and country clubs. 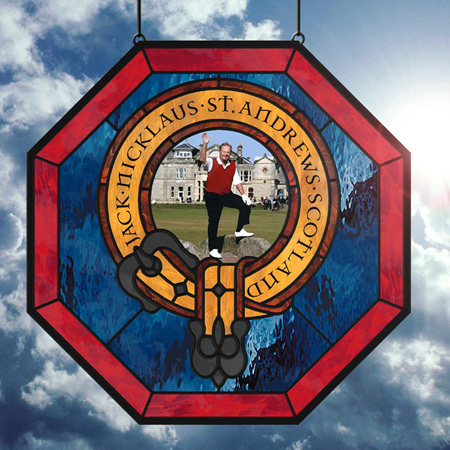 Whether you would like a beautiful stained glass panel to commemorate an an event or anniversary at your country club or you want to have a keepsake from your trip to St. Andrews, Scottish Stained Glass creates custom stained glass crests & panels specifically to fit your needs. Each piece we build is completely custom, so we can work with you to find your perfect stained glass design. Our talented team has the experience to make the crest you’ve been envisioning become a reality. No two crests are ever the same, and yours will become a cherished piece of art within your family, that can last for years to come! Our golf panels are tailored to your specific wants and needs. No matter where in your home you plan on hanging your crest, we can create something that fits right into your decor. On the other hand, if you’re looking for a crest to fit into your country club, we can also work with you to create something that truly embodies the style of your facility. 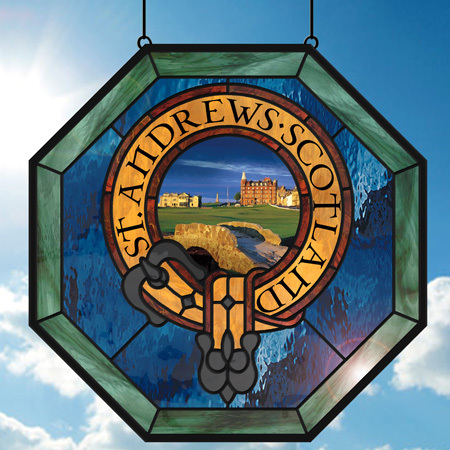 Our designers and builders can’t wait to start working with you to create a stained glass golf crest or panel! Contact us today to get pricing and learn more about our process. We would love to build you a beautiful piece of custom stained glass.